For those of you who do not know yet, Philip and I have decided to leave Norfolk and move back to Lexington. I say back, but I haven't actually lived in Lexington for something like nine years and never as an adult. Philip loves Lexington, it is his Baltimore, and he has wanted to move back ever since he left three years ago and now is the time. It was a really difficult decision since we are both happy in our jobs, just not in our lives. Philip really misses the Lexington art scene and has been in a creative funk since we moved here. The move will mean that we are closer to our families and Philip will have the chance to go back to school and maybe gain some experience in computer illustration. I am going to use this change as an opportunity to finally open my own store, something I've wanted to do since I was 14. Life is full of changes and although we will miss several people in Norfolk and we will definitely miss the Ghent neighborhood, it is time for us to move on. Philip will be flying out on September 13 to find a job and apartment and I will move on October 27. That is six weeks that we will be apart so we will be blogging quite a bit to stay in touch. 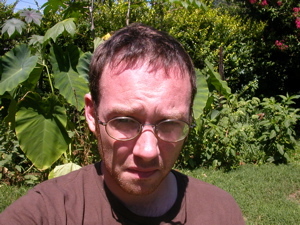 Here is Philip in the jungle that is his parent's backyard. This is one of the few pictures he took last week. How exciting (and scary!) for you! I hope it all goes really well and you get settled in nice and quickly. What kind of store are you going to open? Ooh same question from me. Do tell, what kind of store??? My friend Sarah and I are opening what I like to call an urban country store. We are going to focus on selling hip handmade objects from local artisans as well as textiles. It will be a place for people to come and hang out and it will offer lot and lots of classes. Kentucky is beautiful, I miss living so close to the mountains. Though I haven't ever lived in Lexington as an adult, I do visit my family there and I notice a real sense of community. The biggest problem with Norfolk and Hampton Roads in general is that it is a transient community. People live here for awhile and then move on and there isn't a sense of place or identity much beyond the military. People actually live in Lexington, building a community by supporting small businesses and the arts. These things are important to Philip and I and after a lot of discussion we've decided that's where we want to live and grow old together. If you want to learn a little more about Lexington, visit the Lexicon Project a year-long portrait of life in Lexington. Sounds great! I'm happy for you. I'm still trying to find that place where I want to be. NYC is not where I want to grow old, either. I thnk that sounds like a really great plan, and I hope you are successful and happy there! i'm still agape from viewing the kickass tikki snack server...almost as cool as ne's holographic poodle print. hard to top that. and you won a house? awesome. can we please have late night saturday knitting at your store? 'cause our current location has crappy coffee, and they kick us out into the cold cold night at eleven (as you well know).